Could VR headsets be as common as games consoles or even smartphones? It's been a long time coming, but virtual reality is now on the verge of breaking into the mainstream, making VR headsets as common as games consoles or even smartphones. Some are predicting it's even going to have as big of an impact as the internet - although that might be going a little too far. What we know for sure is that this new age of virtual reality is dominating headlines and attracting investment like never before. To bring you right up to speed with the latest in VR and how it might change your life in the years to come, here's a run-down of everything you need to know. 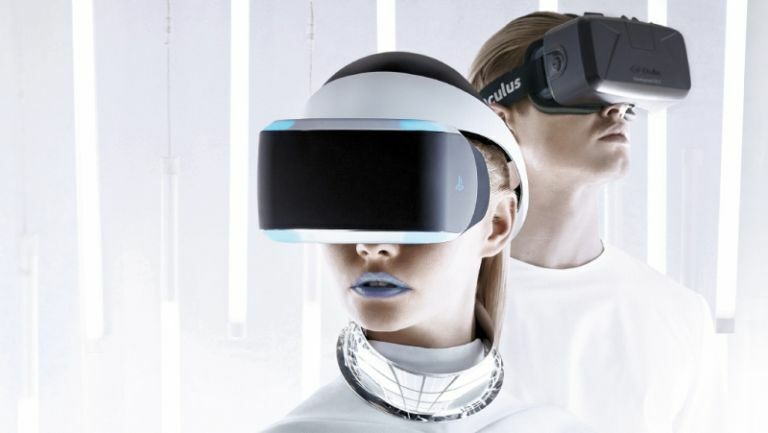 Virtual reality is nothing new but the hardware and software is now much, much better than you remember: high-quality graphics and audio combined with headsets that are lightweight and dropping in price mean that today's VR experience is smooth and immersive. It's like playing on a Sony PlayStation 4 rather than a Sega Mega Drive... and it's going to get better and better from here on in. A 2012 Kickstarter for the Oculus Rift was one of the key catalysts for the new generation of VR kit. Since then Facebook has paid $2 billion to buy Oculus, we have competing headsets from HTC and Sony to consider, and there are numerous smaller startups getting involved as well. In the next couple of years choosing a VR headset might become as potentially complicated as choosing a smartphone. For the first time, immersive virtual reality is becoming affordable for the average consumer - but affordable doesn't necessarily mean cheap. The price of the Oculus Rift hasn't been announced yet, but the company has said that a Rift plus a Rift-capable PC will set you back about $1,500. That's not a complete wallet-buster but you won't be buying one for everyone in the family any time soon. So how is VR going to change our lives? Games are going to be its first route into the mainstream, as you'll know if you've been watching the news from E3 this year. Big-name developers are now lining up to get titles ready for the incoming slew of headsets, titles that will let you gaze all around you whether you're out in space, deep in the jungle or zooming around a racetrack. Movies won't be far behind games in taking advantage of the new opportunities that VR opens up. Oculus is already working on short Pixar-style films where viewers can enjoy a much more immersive experience - imagine being able to live through Toy Story, rather than just watch it. Quite how much control you'll have over the action in a VR film remains to be seen, and it may be that a whole new gaming/movie hybrid format gets invented. Displaying a virtual reality world inside a headset is all well and good, but how do you interact with thin air? Sony's Morpheus device uses Move controllers to help you pick up and push objects, while Oculus has something similar with its newly unveiled Touch controllers - they can recognise gestures like a thumbs up and replicate them in VR. Getting VR input right is still a work in progress, and many games may settle for using a standard gamepad to begin with. Then there's the problem of moving around in a VR world - if you're sat in front of your games console then your body knows you're not running across a football pitch, and that can spoil the experience. Developers and engineers are working on different approaches to body tracking, but right now they're very expensive and not particularly fluid. It's going to be a while before a truly immersive, full-body experience is possible. Some early users of the new breed of VR headsets are reporting motion sickness and headaches - that's because your mind thinks you're moving through space but your body knows you're not. Developers are working to minimise and remove this problem, but we don't know if it will ever fully go away - and there might be a number of people who just can't use VR at all without feeling sick. Developing alongside virtuality reality is augmented reality (AR) - devices such as Google Glass and Microsoft HoloLens make use of AR to overlay digital graphics on top of the real world. For example, you could play Minecraft on your coffee table, or have a Skype call floating in the air in front of you, or turn your bedroom wall into a huge movie screen. In some ways AR is even more exciting than VR. The idea that VR might get so good that you'll never want to leave sounds like a joke, but this is a genuine possibility as the quality of the experience keeps improving. If you can transport yourself to an idyllic island at the push of a button, why would you want to stare at four grey walls instead? In 2015 the idea of living most of our lives virtually seems ludicrous - in a century from now it could be the new normal.